ON TAPE, BUSH IMPLIES HE USED MARIJUANA!! NEW YORK - Private conversations with George Bush secretly taped by an old friend before he was elected president foreshadow some of his political strategies and appear to reveal that he acknowledged using marijuana, The New York Times reported Saturday. The conversations were recorded by Doug Wead, a former aide to George W.
Bush's father, beginning in 1998, when Bush was weighing a presidential bid, until just before the Republican National Convention in 2000, the Times said in a story posted on its Web site. In early tapes, Bush dismisses the strength of John McCain for the nomination and expresses concern about rival Steve Forbes. He also praises John Ashcroft as a promising candidate for Supreme Court justice, attorney general or vice president. According to the article, Wead played 12 of the tapes to a Times reporter. He said he recorded them because he viewed Bush as a historic figure. He is the author of a new book on presidential childhoods. "The governor was having casual conversations with someone he believed was his friend," White House spokesman Trent Duffy said, referring to Bush. NEW YORK (CNN) -- The author who secretly recorded his conversations with then-Gov. George W. Bush told CNN Monday he should give the tapes to the president despite lucrative offers to sell them. Doug Wead -- a former aide to President Bush's father, George H.W. Bush -- recorded about nine hours of conversations with the Texas governor while he was considering his run for the White House. On the tapes, the president appears to admit to past drug use and says he won't join some conservative Christians he sees as "kicking gays." The tapes, first featured in a New York Times article on Sunday, have raised eyebrows -- not only about Bush's comments, but also Wead's motives for releasing them. "Tonight, my agent called me and said, 'Well, do you want to retire a multimillionaire?' " Wead told CNN's Anderson Cooper. But Wead said despite "long lists" of potential buyers, he feels he should give the tapes to Bush, who didn't know their conversations were being recorded at the time. "My initial hope was to record something that would have historical value, but this has become too much," Wead said. "I think I should get the tapes back to him. He was the other person on the line, and they can do whatever they want with them. History can wait." Asked if he had contacted the White House, he said, "I've been talking with an intermediary in the private sector." Earlier in the day, White House spokesman Scott McClellan described the tapes as "casual conversations that then-Gov. Bush was having with someone he thought was a friend." Wead told CNN he has no plans to do more television interviews about the subject, because he believes the story is taking on a life of its own. "I've already told my publicist here, 'I don't want any more TV. I'm going home,'" he said. "I just think this story has become a distraction. "I would rather be a good man with mediocre book sales, than a mediocre man with big book sales. Book sales were never my interest," said Wead, who wrote "The Raising of a President." Wead told CNN that Bush for the most part is the same man in private as he is in public. "There are some pretty dramatic differences, but by and large the same," he said. "In terms of principle, they're exactly the same." Earlier Monday, Wead told CNN that the tapes were a historical record he never wanted made public. Wead said he was thinking about writing a book when he made the tapes, but would not say whether he thought the tapes would boost sales of his book about presidential childhoods. "My book could have been released before the election," Wead said. "It would have been driven by partisan sales." "I hope it sells," Wead said. "I'm a historian, and he's president and has to lead, has to set an example. I had to write about the Roosevelts, the Kennedys, the Bushes. I attempted to vet the stories with all three families." In a segment of the tapes made available to CNN by ABC News, the president appears to admit to trying marijuana. Bush says he "wouldn't answer the marijuana question ... 'cause I don't want some little kid doing what I tried." "But you gotta understand, I want to be president, I want to lead. I want to set -- Do you want your little kid to say, 'Hey daddy, President Bush tried marijuana, I think I will?' " he said. In a segment of the tapes played on ABC's "Good Morning America," Bush says the same holds true for questions about cocaine use, which have dogged him since the 2000 election. 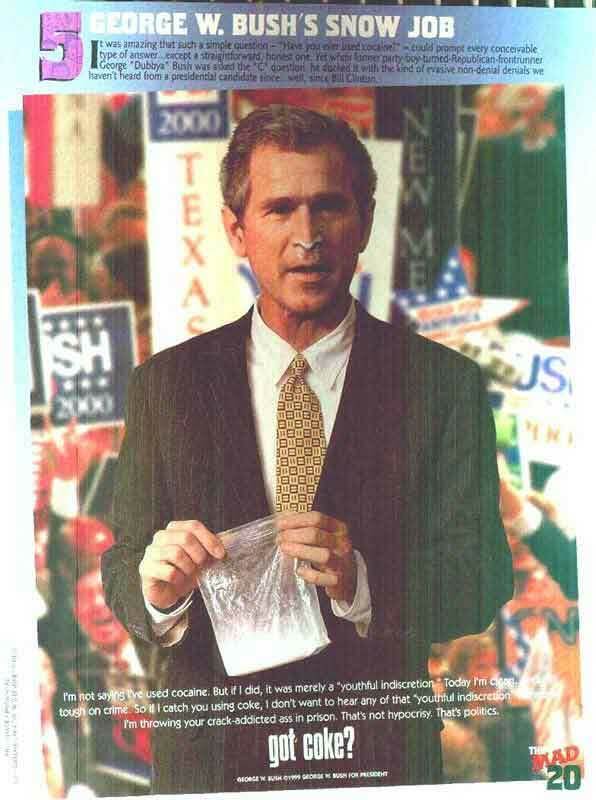 "The cocaine thing, let me tell you my strategy on that," Bush said on the tape. "Rather than saying no ... I think it's time for someone to draw the line and look people in the eye and say, you know, 'I'm not going to participate in ugly rumors about me and blame my opponent,' and hold the line. Stand up for a system that will not allow this kind of crap to go on." Bush also corrected Wead when he said that an evangelical leader had said Bush promised not to hire gay men and lesbians. "No, what I said was I wouldn't fire gays," he said on the tapes. "I'm not going to discriminate against people." Wead revealed the existence of the tapes to The New York Times. The Times hired a voice analyst who concluded after eight days that Bush was the speaker on the tapes. ABC News also concluded the voice on the tapes was Bush. Wead told ABC News that he had played the tapes for his publisher to confirm anonymous sources, and The New York Times somehow learned of their existence. But the Times report says Wead told the paper about the tapes to defend a passage in his book. Wead told ABC that Bush, who has acknowledged past alcohol abuse, spoke about past drug use "often" in their conversations. But Wead told CNN that the drug use was "an irrelevant point to me." "He's already said he was young and irresponsible," he said. "That established the point I needed to make in my book about the man in the shadow. My feeling was because of his indiscretions as a young person, it took the pressure off him, the expectations he'd have to achieve and live up to the Bush image." With attention showered on his brother Jeb Bush, governor of Florida, George W. Bush "found Laura, he found his faith" out of the public glare. "In a 10-year period, he became a millionaire, the governor of Texas, and the president of the United States," Wead said. Hypocrisy makes baby Jesus cry. to achieve and live up to the Bush image." of their foolhardy ways? How does prohibition judge their character? the results are largely the same. give cause for some to jump on the "me-too"
really meant to address unrelated political issues.